403 Marlborough is located on the north side of Marlborough, between Hereford and Massachusetts Avenue, with 401 Marlborough to the east and 405 Marlborough to the west. 403 Marlborough was designed by architect John A. Fox and built in 1886-1887 by George F. Shepard, mason, in a complementary design to 401 Marlborough, designed by Cabot and Chandler in 1885 and also built by George F. Shepard. 403 Marlborough was built as the home of Charles Henry Tilton and his wife, Florence J. (Bruce) Tilton. He is shown as the owner on the original building permit application, dated April 12, 1886. Charles Tilton purchased the land for 403 Marlborough on February 13, 1886, from William Simes, whose home at 401 Marlborough was being completed at that time. To protect access to light and air in the rear of his new home, William Simes included language in the deed limiting the depth of any house built at 403 Marlborough by specifying that the rear façade (except for any bay) could be no less than 32 feet from the alley. William Simes had purchased the lot on October 22, 1885, from William Amory, Jr. All of the land had been part of a parcel purchased on March 1, 1872, from the Boston Water Power Company by a real estate investment trust formed by Grenville T. W. Braman, Henry D. Hyde, and Frank W. Andrews. 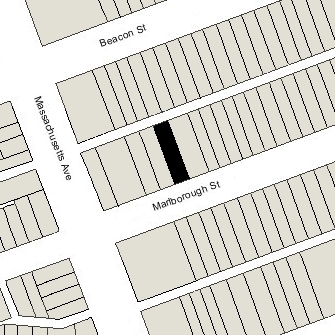 Click here for an index to the deeds for 403 Marlborough, and click here for further information on the land on the north side of Marlborough between Hereford and Massachusetts Avenue. By the 1887-1888 winter season, Charles and Florence Tilton had made 403 Marlborough their home. They previously had lived in Dorchester. Charles Tilton was a shipping merchant dealing primarily in tobacco. On July 15, 1896, Charles Tilton transferred 403 Marlborough into his wife’s name. During 1896-1897 winter season, the Tiltons were living elsewhere and 403 Marlborough was the home of Maria Jane (Grandin) Neyhart, the widow of Adnah Nyhart. A resident of Tidioute, Pennsylvania, she probably was in Boston because of the birth of her granddaughter, Ruth Neyhart, in November of 1896 in Brookline, the daughter of Adnah Neyhart, Jr., and his wife, Grace Grandin (Wright Stephenson) Neyhart. The Tiltons were living at 403 Marlborough again by the 1897-1898 season and continued to live there in 1899. By 1900, they were living temporarily at 64 Commonwealth, and by 1901 had moved to Wenham. Florence Tilton continued to own 403 Marlborough and lease it to others. By the 1899-1900 winter season, 403 Marlborough was the home of George Henry Cotton and his wife, Cora N. (Doane) Stimpson Cotton. They previously had lived at 193 Beacon. George Cotton was a manufacturer of brass tubing and also the founder of the Belmont Springs Water Company. They maintained a second home in Belmont. George Cotton died in October of 1903. 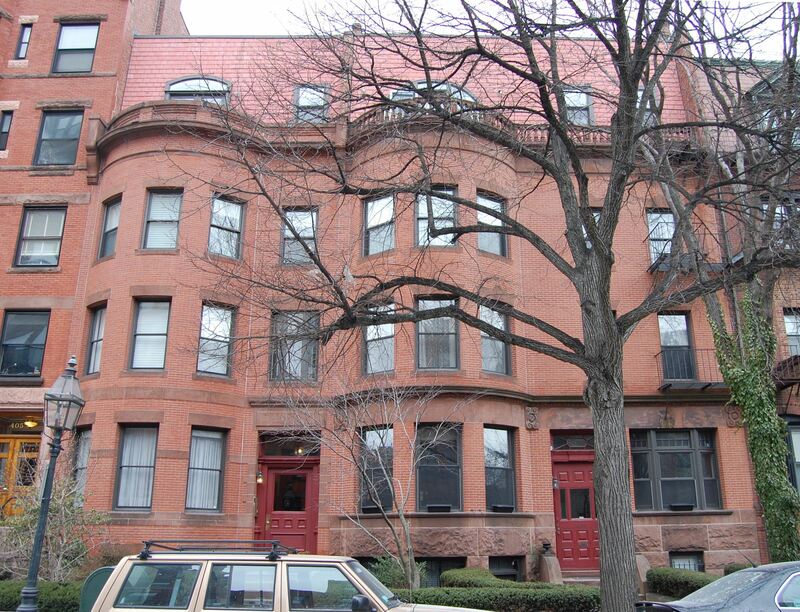 Cora Cotton continued to live at 403 Marlborough during the 1903-1904 winter season, but moved thereafter to Brookline. On November 1, 1905, 403 Marlborough was purchased from Florence Tilton by Mary (Condon) Murphy, the widow of James Murphy. Their daughters, Mary and Alice K. Murphy, lived with her; they both were hairdressers. In 1900, they had lived at 27 Orkney Road. 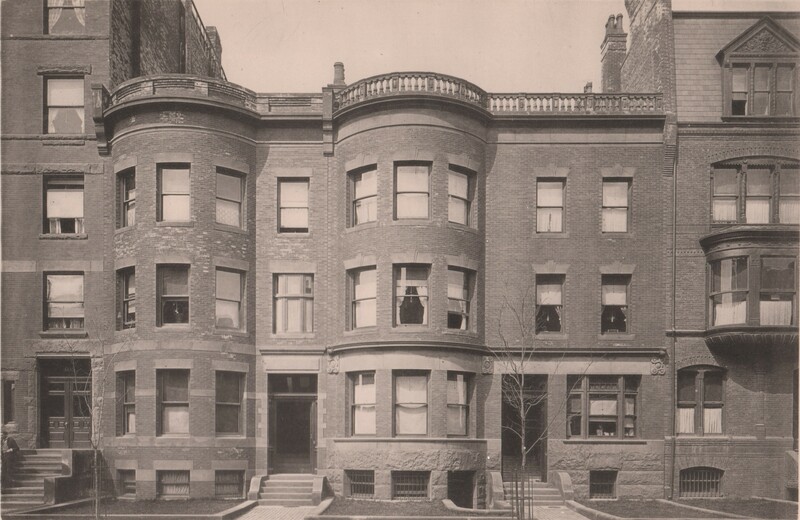 Mary (Condon) Murphy continued to live at 403 Marlborough until her death in June of 1911. After her death, Mary and Alice Murphy continued to live there during the 1913-1914 winter season, but moved thereafter back to 27 Orkney Road. They continued to own 403 Marlborough which they inherited from their mother, and leased it to others. By the 1914-1915 winter season, 403 Marlborough was the home of attorney Roger Fellowes Hooper and his wife, Justine Van Rensselaer (Barber) Hooper. They had married in October of 1914 and 403 Marlborough probably was their first home together. They continued to live there during the 1918-1919 season, but moved thereafter to 191 Beacon. By the 1919-1920 winter season, 403 Marlborough was the home of Harold Francis Mason, a real estate dealer, and his wife, Junia Killen (Russell) Mason. They previously had lived in Cambridge. 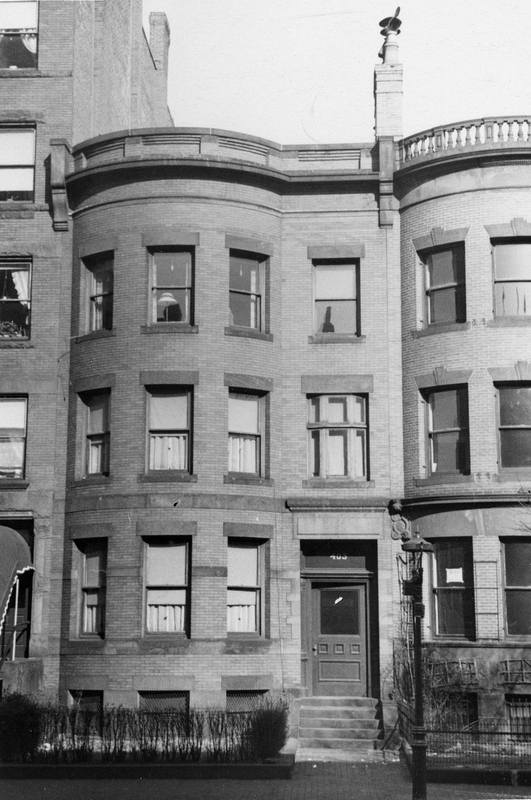 They continued to live at 403 Marlborough during the 1920-1921 season, but moved thereafter to 313 Marlborough. Mary Murphy died in July of 1920, leaving her interest in 403 Marlborough to her sister, Alice, who continued to lease it to others. By the 1921-1922 winter season, 403 Marlborough was the Felix Fox School of Pianoforte Playing, operated by Felix Fox. The school previously had been located at 581 Boylston. He and his wife, Mary V. (Pratt) Fox, lived in Brookline. On June 20, 1927, they purchased 403 Marlborough from Alice Murphy. Harrison Embert Potter, who taught at the school, lived at 403 Marlborough until about 1928. He previously had lived at 173 St. Botolph. By 1930, he was living in New York City. His mother, Mary (May) Ernestine (Bates) Potter, the widow of Wells E. Potter, lived with him. On July 17, 1935, Felix Fox transferred 403 Marlborough into his wife’s name. In about 1936, Felix and Mary Fox made 403 Marlborough their home. The Felix Fox School ceased to be listed in the City Directories at about that time, but he continued to teach piano at the house. On December 27, 1940, Mary Fox transferred the property back to her husband. Felix Fox died in March of 1947. Mary Fox moved soon thereafter. On May 28, 1947, 403 Marlborough was purchased from Felix Fox’s estate by John Reginald Gundry and his wife, Winifred Amy (Wharton) Gundry. Winifred Gundry’s mother, Amy Elizabeth (Cain) Wharton Untz, the widow of Christopher Slater Wharton and Joseph Untz, lived with them. They all previously had lived in Sharon. By 1950, they had moved to 148 Commonwealth. On April 18, 1949, 403 Marlborough was purchased from the Gundrys by Charles Elford Caughey, a harpist with the Boston Symphony Orchestra and an instructor at the Boston Conservatory of Music, and Watson van Steenburgh, a teacher. They previously had lived at 52 Fenway. They continued to live at 403 Marlborough until about 1952. In April of 1955, Watson van Steenburgh applied for (and subsequently received) permission to convert the property from a single-family dwelling into a school of fashion and design. 403 Marlborough was shown as vacant in the 1955 and 1956 City Directories. On February 16, 1956, 403 Marlborough was purchased from Charles Caughey and Watson van Steenburgh by Luykx Incorporated (Dirk J. Luykx, treasurer). In March of 1956, it applied for (and subsequently received) permission to convert the property into seven apartments. On June 9, 1958, 403 Marlborough was acquired from Luykx Incorporation by Bernard R. Leroy, and on October 16, 1958, it was acquired from him by Anthony William Saveri and his wife, Sally Gladys (Rogers) Saveri. He was a sheet welder with Raytheon. They lived at 81 Westland Avenue, where they operated a lodging house. 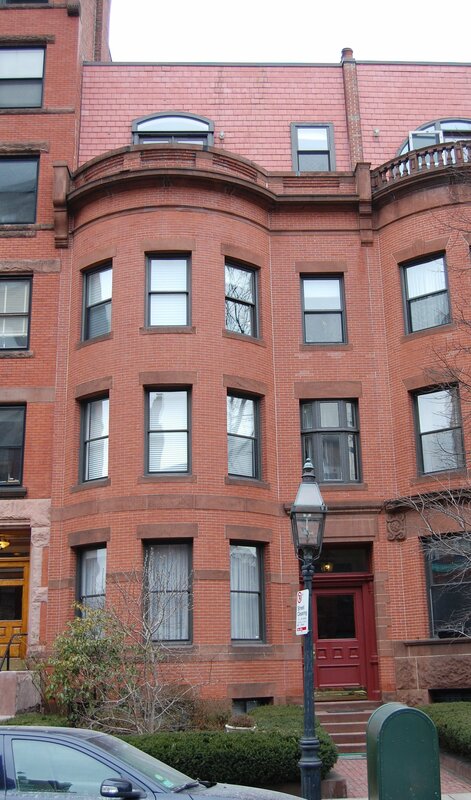 On February 1, 1967, 403 Marlborough was purchased from the Saveris by John M. Le Coq, trustee of the 403 Marlborough Street Realty Trust. In February of 1973, he acquired 401 Marlborough. On September 16, 1975, 401-403 Marlborough were acquired from John Le Coq by Ruth Elaine Noble and Rita Mae Brown. On July 19, 1979, Ruth Elaine Noble purchased Rita Mae Brown’s interest in the properties. At that time, Rita Mae Brown was a resident of Charlottesville, Virginia. On July 24, 1979, 401-403 Marlborough were purchased from Ruth Noble by real estate dealers Farshid Banani and his wife, Lili (Moshiri) Banani, as trustees of the B & N Realty Trust. In August of 1981, the B & N Realty Trust filed for (and subsequently received) permission to combine 401 and 403 Marlborough into a single property, add a fifth story to both buildings, and convert the combined property into sixteen apartments. On September 28, 1983, the B & N Realty Trust converted 401-403 Marlborough into sixteen condominium units, the 403 Marlborough Street Condominium.